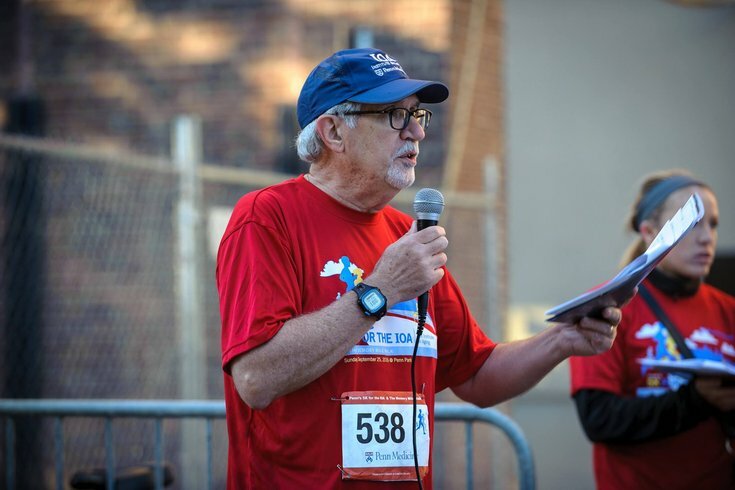 Dr. Patrick Brennan, chief medical officer and vice president at Penn Medicine, launched a 5K race seven years ago to raise support for Alzheimer's disease research. Dr. Patrick J. Brennan understands the difficulties that millions of Americans encounter as they helplessly watch Alzheimer's disease claim their loved ones. About a decade ago, a neurodegenerative disorder – believed to have been Alzheimer's – stole his father's life. Brennan, the chief medical officer and a senior vice president at Penn Medicine, said the loss left a tremendous hole in his family. "Watching him be robbed of his memory and robbed of his personality as he went through the throes of this disease was terribly frustrating for him and painful – especially for my mother, but for all of us," Brennan said. "It was a very powerful experience, one that none of us will ever forget. It motivated me to try to do something about it." Brennan launched Penn Medicine's 5K for The Institute on Aging, an annual race that has raised more than $250,000 for Alzheimer's research. Now in its seventh year, the race will commence again at 8 a.m. Sunday at Penn Park. The event, which also includes a walk, features free food, t-shirts and parking for all participants. Plus, giveaways from Di Bruno Brothers, Spread Bagelry, Wawa and other businesses will be distributed. More than 500 runners, walkers and volunteers are anticipated. Online registration closed on Tuesday, but walk-up registration will be available for $35 on Sunday. Each year, the event raises between $40,000 and $50,000. "It's very personal for me," Brennan said. "As I appeal to donors, I talk about my own experience with my family. It's such a common condition now that I think most people in one way or another have been touched by the passing of a parent or a grandparent, or an aunt or uncle, or a sibling. It's something that is really quite common in our society." The Institute on Aging – Penn Medicine's research and education center for age-related diseases – awards the proceeds to young researchers who have yet to acquire national fundraising grants. "This helps them get a project off the ground where they test some new ideas," Brennan said. "Eventually, that's where breakthroughs are going to come from." Within the next decade, Brennan said he hopes researchers can make significant progress toward finding a cure, if not finding it. Current research has targeted common features found in patients across the Alzheimer's population, but much remains to be studied. "While there are promising developments, progress has been slow," Brennan said. "We still don't have an effective treatment. It's been made a priority and there's money pouring into it. Organizations, like ours, are the ones that are going to find the answer."